A group of students are supposed to have a test, a national test. At the neighboring school there has been a massacre threat, but the students are kept in class to finish the test. There are disturbing elements in the class, a student, Vidar, has been expelled and moved to the neighboring school. Is he behind the threats? National Test describe how a small society is torn apart by fear. 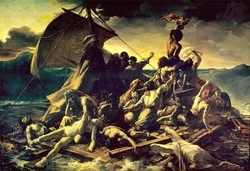 The scenography is inspired from the painting 'The Raft of Medusa' by Théodore Géricault. It is an over-life-size painting that depicts a moment from the aftermath of the wreck of the French naval frigate Méduse, which ran aground off the coast of today's Mauritania on July 5, 1816. At least 147 people were set adrift on a hurriedly constructed raft; all but 15 died in the 13 days before their rescue, and those who survived endured starvation, dehydration, cannibalism and madness.